If Green Day's revved-up performance on the floor of Staples Center at Thursday's 2012 MTV Video Music Awards got you psyched, then you're in luck. The veteran punk trio will hit the road starting November 26 for a four-month North American tour in support of their upcoming album trilogy, ¡Uno! ¡Dos! ¡Tre! The first leg of the tour will begin with a show at Seattle, Washington's Paramount Theatre and hit a number of intimate venues through mid-December. Then, in January, they will bring the noise to arenas around the nation, starting with a January 7 gig at the Resch Arena in Green Bay, Wisconsin. Those shows will last through a February 8 gig at the MGM Grand Garden Arena in Las Vegas, Nevada. Members of Green Day's Idiot Club fan club can start buying tickets for the gigs on Wednesday, with each online purchase giving them access to a free download of ¡Uno!. The general public can start buying tickets beginning on Friday. and put on a blazing performance of "Let Yourself Go" on the floor of Staples in the middle of a jacked-up group of fans. 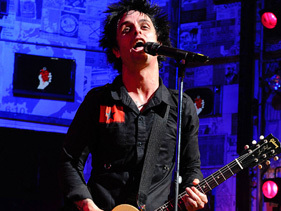 Playing on a pink-and-green floor and surrounded by screaming fans, the song was vintage Green Day, with drummer Tre Cool providing a lean, unrelenting backbone over which Armstrong chanted, wailed and sang-spoke. Finally, he invited the crowd to pounce. They happily complied, consuming the band in a tsunami of sweaty limbs and head-banging enthusiasm. Armstrong all but disappeared in the punk bedlam, the only indication he was still alive his pulsing cries of, "Let yourself go!"